Can a fancy tonewood make the difference sonically as well as visually? An exceptional guitar that provides luxury and value for money - a very rare thing indeed. Decorative tonewoods are a pretty divisive subject among guitar aficionados. Who here hasn’t ooh’d and aah’d at a figured piece of maple at least once in their life? But for all the PR-talk of exotic tonewoods that have been sourced from the last dozen examples left in the market, there remain a good number of people who would trade even the rarest of materials for a bog-standard solid mahogany back and sides, no questions asked. We’ve featured Larrivée for years and years now. And while they are undoubtedly beautiful guitars, we’d never have accused the company of opting for style over substance. So to receive a limited edition guitar from them that features an unusual and visually striking exotic tonewood for the back and sides is quite the event, and begs for us to engage in the ol’ tone-versus-looks debate. What’s more, Larrivée and distributor Sound Technology is offering the Silverwood upgrade package on the OM-03, D-03, L-03 and P-03 models free of charge-meaning that these rather fetching new perks cost no more than the regular models. Sounds...er... good, right? Out of the box, the OM-03 definitely impresses thanks to the beautiful Silver Oak used for the back and sides. The satin finishes brings out the lovely figured grain perfectly - it’s not a million miles from flamed maple but to my eye it’s a little more detailed while also being a little more subtle and classy. It gives you that impression that this is a very finely made guitar, without looking ‘too much’. Now, while this gorgeous choice of tonewood might be the headline feature of the guitar, it’s actually only part of the package you get that makes this upgrade so compelling. In fact, the upgrade models come with a top fashioned from a high grade, premium Sitka spruce normally only found on Larrivée’s 10 series models, along with the smart black stripe binding from the 09 series. It all combines really well in terms of looks but these upgraded tonewoods also hold the potential to offer a considerable improvement in tone as well, particularly in the long term as the woods mature and the benefits of the high quality materials really begin to show themselves. The fact that this is all available at no extra cost is pretty staggering and a big win in Larrivée’s corner. Elsewhere on the guitar, we have an ebony headplate, fingerboard and bridge, all as immaculately constructed as you would expect. The fret finishing across the fingerboard is practically faultless, with incredibly smooth playability in string bends and vibrato, and a perfectly set action with pin-sharp intonation. The design is fairly austere, with the logo sitting neatly on the headstock and a set of dot markers the only adornment on the fingerboard itself. The carve of the mahogany neck is every bit as pleasing as we remember from our last time reviewing a Larrivée - the fingerboard feels wide enough to give you greater accuracy in your fretting hand, but the whole thing never feels bulky or obtrusive - it just fits. The OM-03 also packs in extra value by coming equipped with an LR Baggs Anthem electronics package. Featuring a discreet set of controls under the soundhole, the LR Baggs system adds a whole heap of extra functionality without sacrificing the OM-03’s natural good looks or playability. The trade-off is that tuning becomes more of a traditional affair, but of course, there are more than enough affordable tuning pedals out there to choose from. The system partners the company’s Element pickup with a microphone, offering volume, mix and phase controls to tweak the input from the two sources to your liking. All things considered, the OM-03 Silverwood is another stunningly-built guitar from Larrivée. No matter how many times we review one of the builder’s guitars, we’re always struck by just how well constructed they are and how well they play. The sheer quality of the tonewoods, craftsmanship and playability puts many similarly - and even higher-priced - instruments to shame. It’s hard to imagine a guitar that packs as much value and quality at this price, and that’s saying something. As we mentioned before, there’s usually a risk that guitars sporting exotic tonewoods can disappoint tonally or with little errors in the quality control stage. The latter is 100 per cent, certifiably not an issue with the impeccably built OM-03 Silverwood, and it perhaps should come as no surprise either that the guitar sounds the absolute business as well. Oak is a fairly uncommon as a tonewood, and traditionally is very stiff and dense as a material, which lends itself to a brighter sounding instrument. So that’s what we expected here and to a degree that is true - the high end is wonderfully voiced, with a shimmering, crystalline quality that just stays on the right side of the tonal spectrum without becoming shrill, even if you push it really hard. However, there’s actually a greater depth of tone than you might think. It’s not got the same mid-push as a mahogany bodied instrument but it’s got a certain snap and body of tone that backs up that wonderful high end nicely. In terms of a visual metaphor, imagine a coloured font typed out on a computer screen. Where rosewood or mahogany adds a solid outline to the letters to create a crisper, easier-reading look - the Silverwood adds a shadow. It’s not the same kind of contrast but it gives you the depth and distinction you need. If that’s confused you no end, then we’d simply say that the low end tones of the OM-03 are very clear and dynamic, with enough bass to make low notes thump lightly against your ribcage but without the thunderous, ringing quality you’d expect from something like mahogany. It’s a very nice balance that just sounds subtly different from your average tonewood. It’s a very addictive quality that makes you want to try out all your favourite riffs to see how the OM-03 will colour them in a different kind of way. Fingerpickers and flatpickers alike will both find much to love about the OM-03 - both styles sound sublime with this tonewood combination, and the overall playability of the guitar makes both approaches seem utterly effortless. Plugged in, the impressive performance continues, with the LR Baggs system providing a versatile and detailed electro soundscape. For our tastes we started off with microphone-only input, before dialling in an appropriate amount of pickup signal until we hit the sweet spot between both inputs. It’s an effective system that doesn’t take ages to tweak. But, of course, if you’re the kind that prefers to get the sliders of a control unit in a certain position and keep them there, then it may be worth looking at another model that comes with the a Stagepro package instead. We expected to come away from this review thoroughly impressed with the Silverwood, but probably with a slight preference for the original mahogany-backed model. However, once again Larrivée have subverted our expectations and turned our thinking on its head. If we had the choice between the two models now, side-by-side, then we daresay we’d be tempted to pick the Silverwood option. The upgrades are substantial and provide great value for money, with the silver oak providing a surprising and really very beautiful tone as well as a distinctive and visually appealing new aesthetic. The fact that all this has been introduced at no extra cost compared to the original guitar’s RRP is frankly remarkable, and if these don’t sell like hot cakes then there’s no justice in the world. Larrivée has consistently produced some of the most playable and rewarding acoustics in this price range and this new OM-3 might well top the lot. 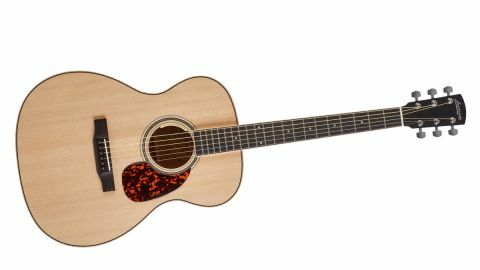 It’s exceptional in just about every way and we don’t hesitate to recommend it to anyone that’s in the market for an acoustic in this price range. Go try one as soon as you can - we very much doubt you’ll be disappointed.